The generic menu, like in Loren: POSITIVE/NEUTRAL/NEGATIVE. The player has no idea what he picks until he does. The misleading teaser: HIT ON HER / APPOLOGIZE / DISTRUST HER. The player has an idea of what his reply will mean but does not know the words until he does. The short version: WELL, YOU'RE SUSPICIOUSLY HOT / SORRY, TALKING TO MYSELF / WHY SHOULD I TRUST YOU? The player has a general idea of what his reply looks like, no real surprise left. I've been talking with "The Hospital" writer, and he asked me a good question. So good, that thought to make a poll! Which brings me to a question that will affect how I do things in Ren'Py: how do we present the choices to the player? 1- The generic menu, like in Loren: POSITIVE/NEUTRAL/NEGATIVE. The player has no idea what he picks until he does. 2- The misleading teaser: HIT ON HER / APPOLOGIZE / DISTRUST HER. The player has an idea of what his reply will mean but does not know the words until he does. 3- The short version: WELL, YOU'RE SUSPICIOUSLY HOT / SORRY, TALKING TO MYSELF / WHY SHOULD I TRUST YOU? The player has a general idea of what his reply looks like, no real surprise left. I have seen people like and hate all three of these. What do you think? Personally I said the best one is the 3rd. However I thought to ask in public, maybe the other two have some positive sides that I've missed? I like to know where the conversation is going. I do not appreciate picking a choice that looks like I was going to give a compliment, but ends up with my character being sleazy and suggestive, just as an example. I remember some Bioware games where the conversation went in a completely different direction than what I thought I was picking. I don't enjoy that. Ren'Py has rollback though, and I'm not afraid to use it! Like Franka, I like to know where the convo is going as well... I like to go with what the player's words will really mean/taken as. Although I'm not completely opposed to #3, showing actual wording in one sentence, when the real response will in fact be 3 paragraphs long, can be as misleading as vague neg/pos-options. "That dress suits you" may equal either ACT AS A SLEAZEBALL or BE POLITE depending on what it will be followed by. Thus my vote for #2. Option #3 is the best. Clear as day what the MC is saying, so no risks of misunderstandings there. Thanks to all who answered so far. So from what's said here, what you guys REALLY want to avoid is a misleading answer, one that SEEMS to say "my character will do X" but "ends up doing Y"
I realize it is somewhat close to option 2 but to me, it allows you to know EXACTLY what form to expect without spoiling the flavour. It also allows you to develop your character in a chosen direction. For example, there could be a number or times where one of the choices is something like "TELL IT LIKE IT IS!" Indicating that your character is about to be direct and care little for social graces. The spoken line would obviously be different each time but the flavour would always be the same so, if that is the sort of character you like to build, you'd be able to pick that sort of dialogue easily. I'd still rather go with 3. Even with categories like "be bold and playful" you still risk cringe-worthy dialogue you may not have expected. Yeah, it does reduce the surprise, but in this case you're asking us to pick our character's response, so I don't think that's a problem. Especially if the whole idea of the genre is to guide a story based on our decisions. There is still some element of surprise in that we don't quite know how the NPC will respond. I really hate the way Bioware handled this in The Old Republic and the Mass Effect trilogy. 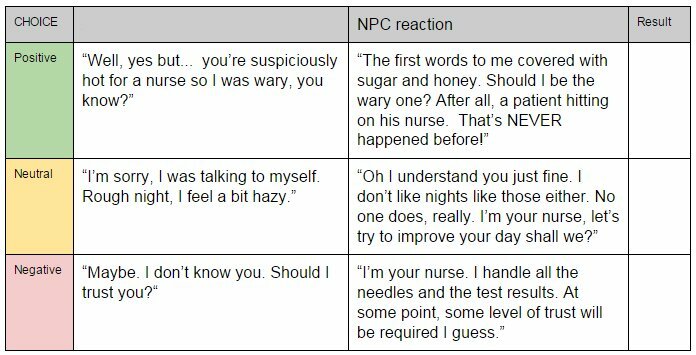 Where even though you know which is the nice and mean option, the actual dialogue is often very different from the few words of the choice you are given. I want to know the Exact thing my character is going to say. The choice am making should not be a surprise at all, the repercussions of that choice should be the only unknown factor. Is there any reason you can't just show the whole line that the player character will say? If you can't do that then I think I would prefer to just pick between POSITIVE/NEUTRAL/NEGATIVE because that way I don't have as much expectation of what the line will be so it won't as disappointed when it's different.But if you are going to give a hint as to what the player will say just make sure the tone in the preview matches the actual line. I went ahead and added this, sigh sadly reset the poll results. But just to remember it was very big in favor of option 3. OhHaiMe wrote: Is there any reason you can't just show the whole line that the player character will say? It's a problem of screen space. The choice button have a limited size, and sometimes the answer can be quite long. Also maybe sometimes the first sentence is just a part of a much bigger reply. So it's not easy to do, unless the game is written with this in mind from the start, and writer always tries to have as the first sentence the most indicative of what the player will be saying... but I think is a bit hard still? Actually the length of the replies is not that much of an issue so far, I have kept replies rather short (both the character and the NPCs) to keep a sense of active dialogue. But yes, I do not deny the possibility of longer replies later in the game. However, I would not expect long monologues. I prefer writing active, dynamic conversations.